Pros: Good value, several features, brilliant support and up-time. Cons: Not enough support mediums, lack of installable software. Bottomline: Reliable host offering great quality services. Simple. Minimalistic. Fresh. These are a few words that come to mind when visiting the ClickHOST website. It is in no way messy or cluttered, it is straight to the point and contains all the information a potential customer should know about. 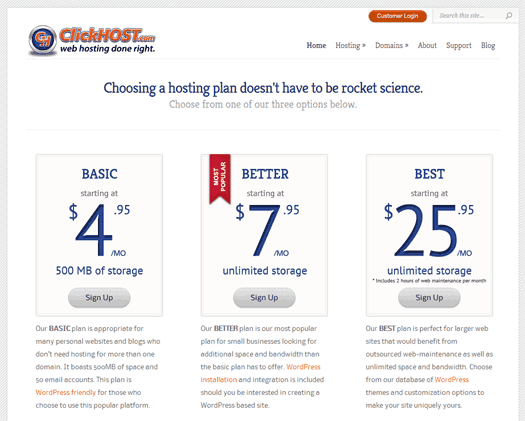 ClickHOST is a fantastic example of a webhost that doesn’t scatter mass amounts of information all over their homepage. They know what their selling; they know what their potential customers want and that’s how they perceive themselves. The Basic plan is suited for individuals looking to run a small website that does not need many features such as the use of databases or additional domains. It also comes with a limit of 500 megabytes worth of disk space which is plenty for a basic website. The final plan, considered the ‘Best’ plan to purchase is essentially a mirror of the ‘Better’ plan. So, I bet you’re wondering: “Hey, what am I paying an extra 18 dollars for?” It’s an understandable question to ask, but quite simply, you get the Dedicated SSL certificate and the Static IP thrown in for free, as well as 2 hours worth of website maintenance. Is it worth the price? Personally, I’d say no, but that’s for you, the potential customer to decide. Initial set-up of your website is free which is always a bonus, as well as transfers. They claim to support WordPress as one of their main applications by offering to even install it for you and offer you tools to integrate your current WordPress website seamlessly. As far as support goes, they offer a 24/7 e-mail system. They unfortunately do not offer phone support of any kind however; they do state that if for whatever reason you are in need of phone support, they request you open a ticket stating why and they will call you during business hours. Their live chat system is only open during the business hours of Monday to Friday at 9am – 5pm. If you’re at all dissatisfied with the service, you are given the opportunity to request a refund for the lengthy term of forty-five days, which is extremely generous. The thing I love most about ClickHOST is its exceedingly small terms of service agreement. They use simple grammar to extend their points across to their potentially weary customers. Although, the fact that it is short does not mean is it not concise or straight to the point. The agreement is as straight-forward as one could ever be. It states their services are not designed for large enterprises, more so for smaller independent ventures. It also contains an acceptable use policy which states you may not host illegal content, proxies, pornographic content and other content in a similar nature. It also prohibits using your site to host serials, cracks and warez content as well as unsolicited and bulk emailing and spamming. They also claim that they provide a 99.99% uptime guarantee, as most other hosts do. After signing-up, I received a welcome e-mail stating my account was in the process of being set-up and I will be informed shortly when set-up is complete. The e-mail also contained my login information to login to the webhosts client area. I received another two emails; one confirming my order and another was an invoice stating it was my official receipt. Around fifty minutes to an hour later, I received an e-mail stating my new web hosting account had been successfully set-up. The e-mail contained all kinds of useful information such as login details to the control panel, FTP account logins and webmail/e-mail settings. The bottom of the e-mail showed a small note thanking me for my decision to host with them. As far as testing is concerned, I decided to take a look at their control panel. I was hardly surprised to see that ClickHOST makes use of the cPanel control panel, as several other webhosts such as GreenGeeks and InMotion do. However, the control panel felt very limited. They do not offer all of the cPanel features available such as the Fantastico script installer. They instead make use of a ‘site software’ resource. This resource is very limited as they do not offer the ability to install Drupal or Joomla (Sorry guys, looks like you’ll have to install it manually). I decided to install a few random services they have on offer. I started off with an e-commerce shopping cart called OSCommerce. Installation was straight-forward, as I inputted my login details and where I wanted the software to be installed. It installed it seamlessly and gave me an administration link afterwards. I tested a few other services to see if they behaved similarly. I tried out phpBB3, it was similar however I did not receive a link to an administration link. This is bad news for newbies who wouldn’t know how to find the administration panel. I also couldn’t login to the forum at all. Issues like this will most likely deter customers to continue using the service if certain bugs are found here and there. I decided to test up-time as well by using an up-time monitoring service called Pingdom. 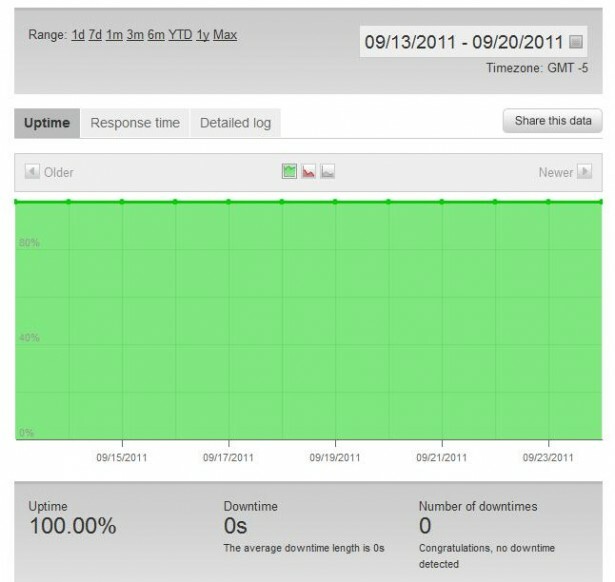 As previously stated, ClickHOST claims to have 99.99% guaranteed up-time. Well, it seems they’ve exceeded their claims as Pingdom states they have an amazing 100% up-time for the first hosting week. It is beyond impressive to have this amount of up-time and no downtime at all in the first week. As ClickHOST do not primarily offer phone support, I decided to start a live chat with one of their support representatives. They currently offer a 24/7 e-mail support service and they offer live-chat technical support during their business hours. (9am to 5pm from Monday – Friday). I decided to open a live chat conversation with one of their representatives concerning the fact that I did not receive an administration link to my phpBB3 forum board and that I could not log-in. A very friendly representative responded quickly and asked what problems I was facing. I explained my problems and the staff-member pulled up all the information required to help solve the problem. Whilst doing this, the member of staff also engaged in a friendly conversation with me about sports. It is always a nice perk to get a friendly support representative that likes to talk to you in a friendly and courteous manner. The representative was able to give me an administration link which solved half of the problem and then set about helping me fix my login issues. In the end, we were unable to determine the root of my problem; therefore the staff member gave me all the available resources he could so that I could attempt to fix the problem myself. Before I left the live-chat conversation, the representative provided me with additional contact details in-case I could not solve my issues, stating that if the issue cannot be resolved, they will work in a close manner with me to ensure this problem is fixed. 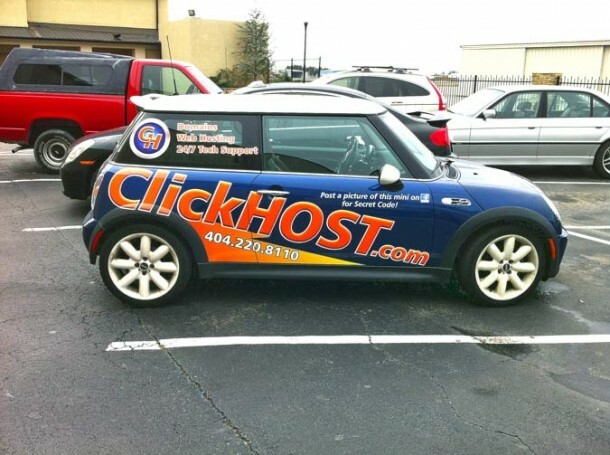 ClickHOST provides quality plans for individuals and independent business owners offering a wide array of services and features that’s sure to get you on the band wagon. They show consistently good up-time results as well as extremely friendly customer support agents. Their support services could be much better by extending their live-chat hours and offering phone support and maybe one day that could become a reality. They offer a somewhat small list of online software due to their relatively unknown software installer and by not offering industry common online content management systems such as Joomla may lose them many potential customers. Disclosure: Leverable, the company that owns webhostingcraze.com has a CPA agreement with ClickHOST and may receive compensation for sales referred from this site. Also, Leverable later undertook SEO services for ClickHOST. The writer of the review was not aware of or influenced by either of the above. Details about our awesome web hosting review process are outlined here. – We would be more than happy to install any Linux based software for our customers and we do it on a regular basis. We host numerous Joomla websites. – We will soon also offer a more comprehensive software installer. We are testing a few. – We will be adding more support options in the future to compliment our 24×7 email support, live chat support and “we’ll call you” phone support. I’ll be more than happy to answer any other questions or queries directly. Just email me: carel[at]clickhost[dot]com. Thanks. I have to give Smair all the credit for all the research, testing and penning the details. It’s the “icing on the cake” effect when the owner follows up on the review. The “we’ll call you” feature sounds interesting. I don’t think I’ve seen anyone doing that yet. We’d love to hear more about that from you when this goes live, so please feel free to post again here. We now offer one-click installs for WordPress, Joomla and 245 more scripts via Softaculous. I would be very surprised if your software, or CMS is not installed in this comprehensive list. We list offer the other script installers, “Site Software” and “Fantastico” on most of our servers. Thanks for keeping us updated. Softaculous should keep the curious webmaster pretty busy. I see it has a bunch of social networking and even ERP scripts in there. Nice toys to play with. Merry Christmas to you and the ClickHOST team as well. Emory, I hope to see you and some of your regulars at WordCamp Atlanta, from Feb 3-4. See: http://clickho.st/WPc2012. We’ll have an awesome special for the show with ridiculous pricing on our WordPress hosting. Come and say hi to myself, Carel and some ClickHOST peeps. Carel, not sure if I will make it this time (I procrastinated too long and now it appears full) but I’m curious to know how it goes. If you get some good pics, please let us post some here for everyone. Just a quick note to let you know that we now offer FULL malware/hacking monitoring to all our customers at no cost. Our BEST customers also get unlimited cleanups for FREE, while BASIC and BETTER customers would pay $20/case if they want us to cleanup malware or hacking. I’m good without live chat as I would rather talk to a real person over the phone. That’s what I’m going to miss the most about GoDaddy, all of the friendly talks I had with their support people. Then again, that’s the reason I’m leaving GoDaddy.